2015 is shaping up to be the year of the baby. Not just because we are expecting our first one, but because I currently know A LOT of people expecting. In fact, I recently attended a wedding in which I was one of EIGHT pregnant women (at least that we know of)! 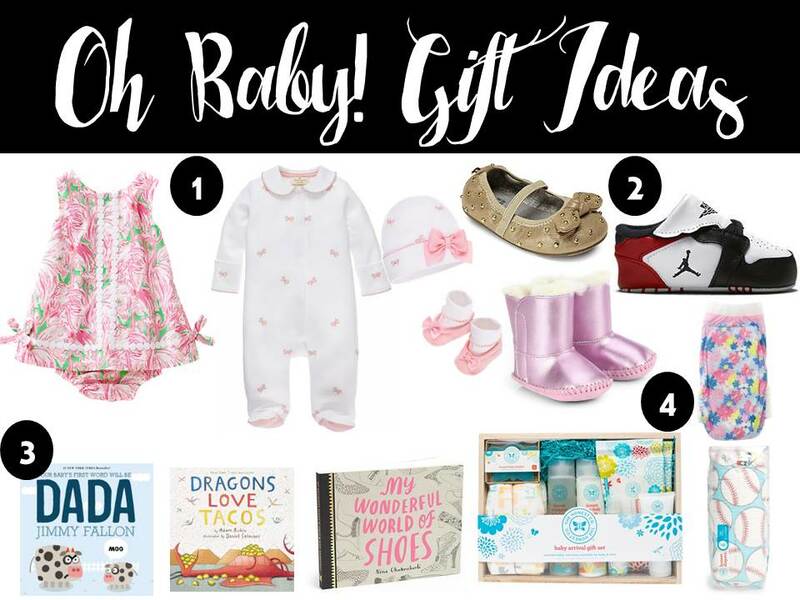 Knowing that we have a lot of baby showers coming up, I thought I would share some gift ideas - based of what I was happy to receive and what I like to gift! 1. Clothes: I know. New moms get A LOT of clothes. But if I’m going to buy an outfit, I’ll splurge on something a little more pricey that the mom may not want to invest in. Some of my favorite brands include Lilly Pulitzer, and now...KATE SPADE BABY (you can guarantee Baby Girl got some threads on the first day this collection was released). 2. Shoes: You can’t start out live on the right foot with a fabulous pair of shoes. Yes, like clothes I know kids totally out grow these, but with my rationale above I like to go for a pair of shoes that the mom may not necessarily invest in. 3. Books: I know that a lot of showers are asking people to give books vs. a card, but prior to that trend I loved to buy people books. I guess it’s because I loved to read as a kid. I’ve wrote about my favorite kid books in the past here, but a few other good ones are below and above. I’ve wrote a lot of book blog posts - here’s some suggestions from past posts! 4. Essentials: This is one gift I don’t give enough, but we’ve received a lot of and it’s awesome - baby essentials! I’ve been buying a variety of brands because we don’t know what Baby Girl will like, but appearance and ingredient wise, Honest has some awesome options. Honest New Arrival Gift Pack - ON SALE for just over $30 at NORDSTROM!